Oversized Accent Chair Furnstyl always plays fashionable and functional role in all sitting area. With their large size, these chairs can visually balance a large sofa or sectional or make grand, expansive rooms feel more luxe. Their generous proportions also provide comfortable seating and can even allow two people to cuddle up comfortably. 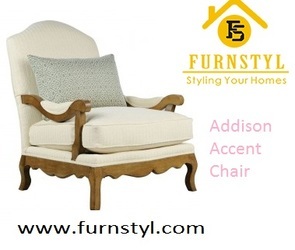 If softness and plus size are your priority then select Lounge and accent chair of Furnstyl. We provide you best solid luxury Furniture at Nominal price and don’t make any hole in your pocket. Please kindly visit our showroom at B-159, B Block, Sector 63, Noida, and Uttar Pradesh-201307 or for any inquiry call us at 012042705O5.